If you are looking for small boutique hotels and guesthouses right in the middle of the city center, then stay on this page.Because I’ve found a few – quite a few actuallly, that are really nice, unique, luxurious, private, beautiful and what I can find of positive superlatives. I’ll just give you some of them (otherwise this will be a very long and maybe a bit boring article with the recording of 27 different hotels). There are big differences between the small hotels – they range from extremely spartan cheap ranks with more or less service, to deluxe boutique hotels that are refurbished and looked for in every detail. Several of the slightly larger hotels have hired award-winning Chefs and have phenomenal restaurants attached. So this alone can be an experience. The price of the stay varies from 20 € to 150 € per day – approx. Of course, there are high and low season and periods for all the hotels, so it’s worth looking around. When I quickly made a search for available hotels in late March, the difference was not that big. 74€ for 3 nights and breakfast at a – in my opinion, lousy hotel and 100 € for the same period in a fantastic hotel. Yes please to pay 27€ more and then stay at a really good place. It’s this price, we’re talking about, so most people can join. 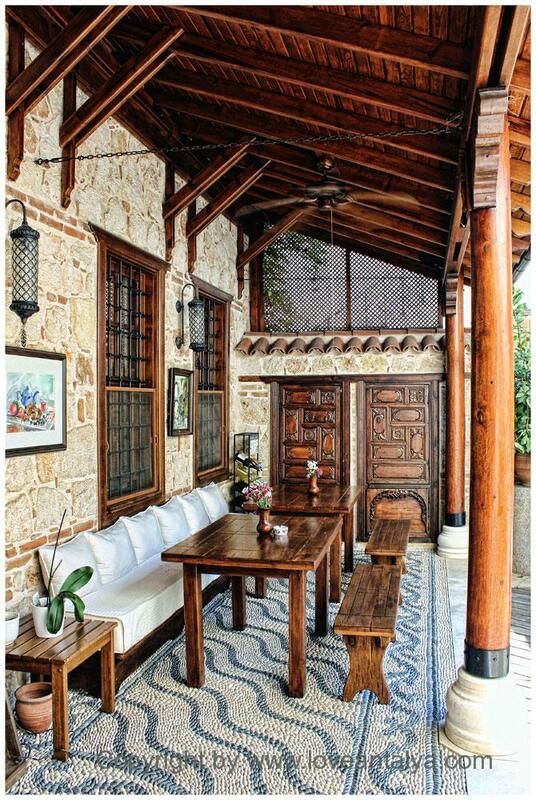 All the hotels and guesthouses are located right in Antalya’s old town, Kaleici (read more about Kaleici here). It means, that they are as central as possible, which implies a short distance to museums, shops, attractions and restaurants. But in some places, it also means that there may be more or less noise from the street. But it is usually something, you are aware of, and maybe are an okay price to pay, if you want to be close to all the other things and have a short walking distance. One may, however, be fortunate that some of the places are on a relatively unmarried side street, so there is almost no noise. These places in Kaleici, are most popular outside the summer vacation period (as it is simply too hot in the city during the season). That means, they are ideal in spring months, April, May and June, and again from late September to October and November (December may also be ok, but it is more cold). If you want to read more about the little cute hotels and guesthouses versus the big ones, you can readily read in one of my previous articles “Where to stay in Antalya? Authenticity vs. anonymity “, where I just write about the pros and cons of choosing one for the other. And why do I look at these little hotels right now (or did – as the translated article is usually 1 month later than the original ones in Danish) ?? It’s simply because I’m going for a short stroll to Antalya – all alone, for myself and without my family. Very, very strange. The reason is something as simple as relaxing and collecting material and pictures for the blog (and my kids are quite frankly a bit tired of me taking pictures …). For that reason I have to find a place to live (at least in those days where I am down town and not living with my father in law and his wife near the mountains). And nothing is more nearby, than finding a place in Kaleici, when I’m going alone and my husband rather wants to avoid living down town. Fortunately, all the nicest hotels are here in Kaleici. And when it’s almost spring there down in this time (and thus not too hot to live so close), it’s obvious that I’ll find something there. Hotel 1207 is definitely one of the hotels, I’m considering to stay at. I’ve passed a number of times and always look an extra time. So I think now it should be – now I have to look inside. The hotel is located quite well in Kaleici and at the same time close to the great Ataturk Caddesi, where all the shops with bags, clothes etc. are located. Char Me is the hotel with the chic name (Charme … get it – because that apparently took me a while). It also looks pretty nice, cosy and well designed although the rooms seem to have some powerful colors (I’m allergic to strong colors). 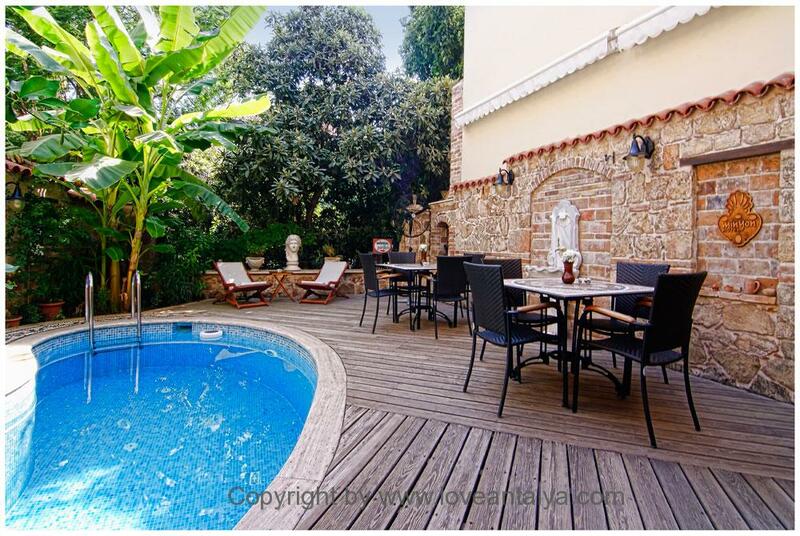 On the other hand they have a nice patio and yard, which is absolutely indispensable in Antalya. Another place I also consider is Villa Perla. That place I’m pretty silly about. I do like, when things at least seem authentic. And I think it does at Villa Perla. And then it looks so nice to me. Especially with the many lemon and olive trees in the yard. I’m never getting really tired of these trees. 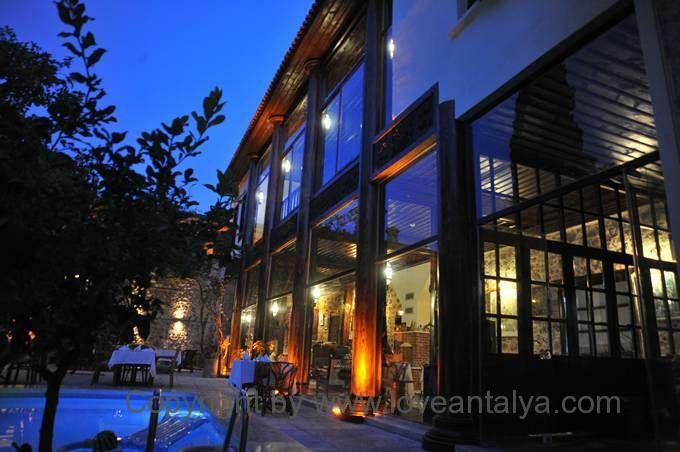 Tuvana hotel is one of the oldest hotels in town and is not far from the old harbor. It is also quite famous for their phenomenal food. 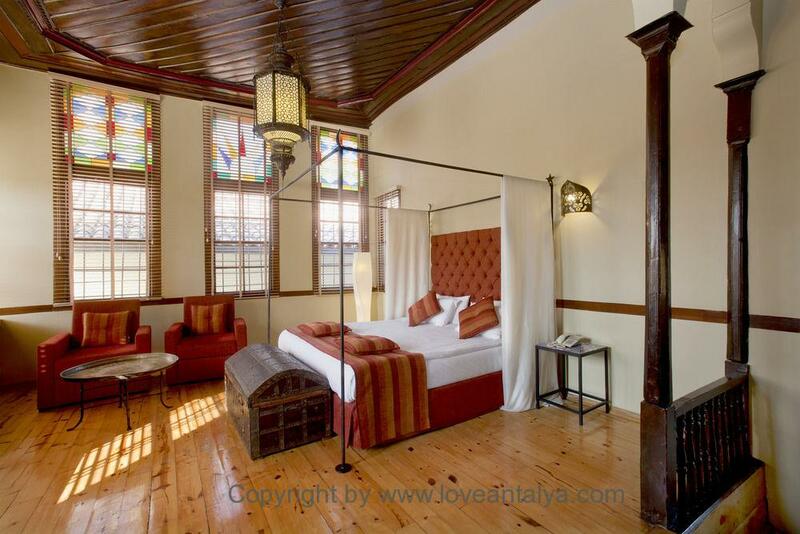 I’m crazy about Tuvana hotel, but unfortunately the price is not just after my purse. It has also been there for so many years, so they should almost recieve a medal for it. And then I would like to introduce you to Minyon hotel – my little precious. We lived here for a while, when my daughter was on her first trip to Turkey (she was 3. months old). It was really an amazing place and beautiful, quiet and peaceful (all that we needed at that time). But the rooms are not recommended with a baby bed – it was simply too packed. It didn’t make the place any less lovable, that they had the best homemade breakfast ever. I have obviously some kind of fetish with stone floors – especially in Turkey. And this floor on the hotel … to die for. I simply cannot forget it (but ok, I’m not going to clean it). I also hope that you may want to go to Antalya and Kaleici – maybe just on short vacation. 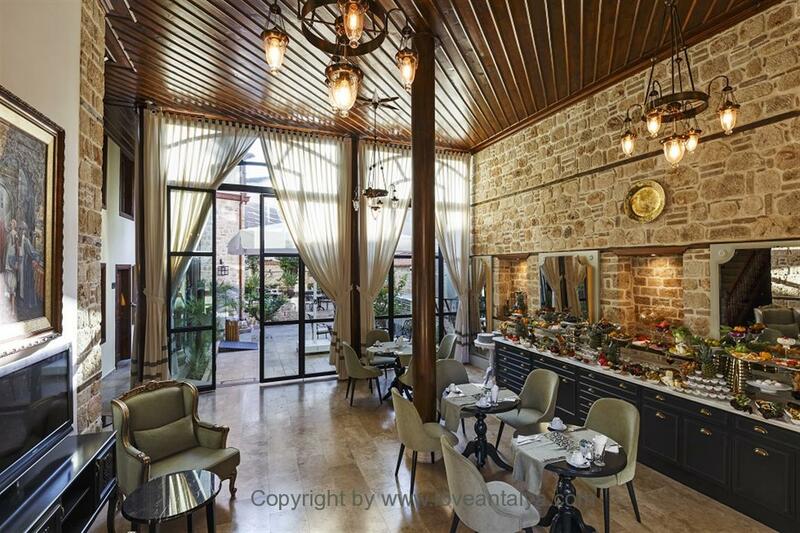 There is SO adorable, nice and pretty inside Kaleici … especially at the charming little hotels.